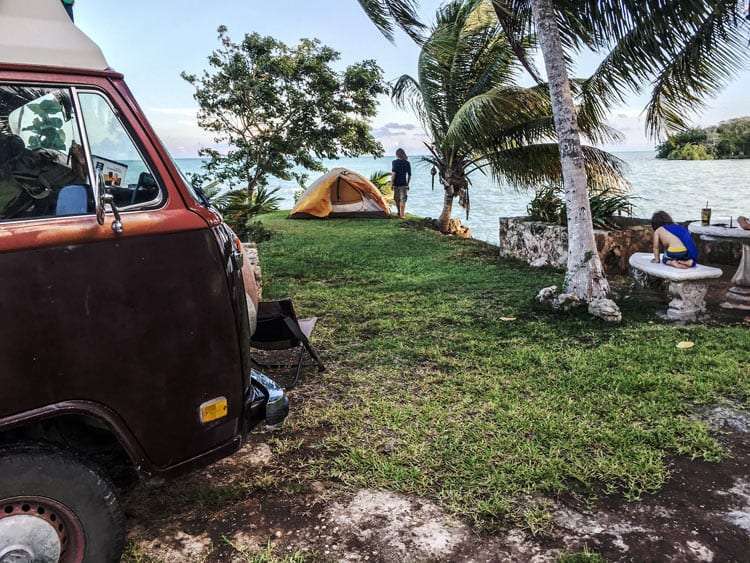 If you’ve ever traveled around Baja California–whether in your Class A Winnebago or 1982 Vanagon–and loved it…Quintana Roo is going to be nothing like that. It’s expensive. That’s to say, it’s “regular vacation prices” by US standards. Nearly everyone will speak English, particularly near the beach and in restaurants. Everything is a little cleaner, a little more polished. There’s very little boondocking, and campground prices lean more toward the $300 peso range than the $100. Gorgeous, but expensive by Mexican standards, RV park right on the Caribbean in a sleepy town north of Chetumal. 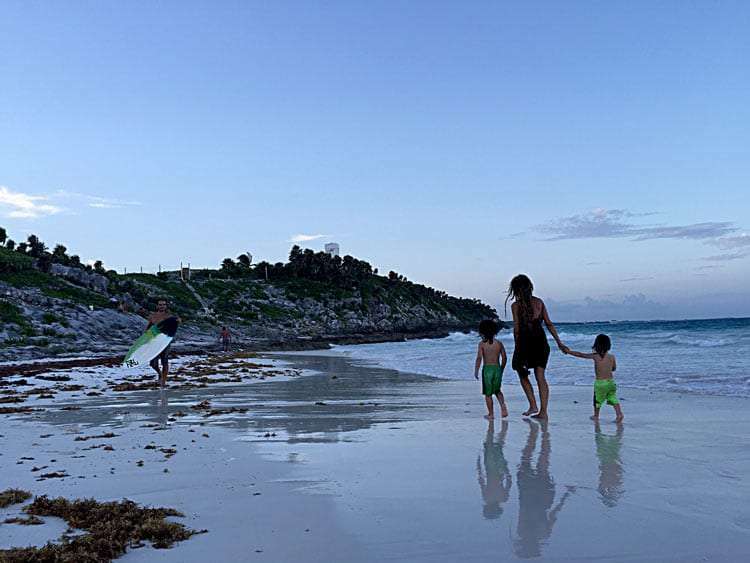 An ocean breeze at a decent price, in the heart of the national park and walking distance to Tulum Ruins. Affordable camping in a parking lot for a cabañas type beach resort in a slow-paced beachfront town. The highlight of the state, you’ll find everything here from craft beer aplenty to birdwatching. Spot your first flamingo by daybreak, kayak through bioluminescence come evening, and take the kids to a two-story trampoline house in-between. A beachside resort offers all the luxury of Cancun’s hotel zone, but with free day use. Score excellent appetizers and try the Akumal Pale Ale while the kids swim and the days go so slow. The food selections are more diverse. The craft beer is more abundant. Cars are newer and the kids are a little hipper looking. “This is their cash cow,” the owner of an RV park outside of Cancun tells me, “so they really take care of it.” He’s a Canadian, now married to a younger Mexican woman, which is how he was able to buy the land for the rather lovely RV park he runs in his retirement years. “Ten years ago, you wouldn’t have recognized it,” he recounts tales of former lawlessness. “No one had license plates. The cops, they didn’t care, if they saw you drinking they’d say ‘Put it down’.” Not dump your drink, mind you, but just set it down in the console until they were out of sight. Quintana Roo is more “civilized”, if that’s the word. More specifically, there are more laws. They take helmets on motorcycles and seatbelts a little more seriously. You won’t find as much rebar sticking out of unfinished buildings or toppled over street lamps left to rot in place on the sidewalk like in the rest of Mexico. We drink beers into the night and swap stories of Quintana Roo. Good question. When we first arrived in Quintana Roo, we were broken down and weathered from a mad dash from Vera Cruz, along the souther Gulf Coast of Mexico, through some territory I wouldn’t describe as “desirable”. “We needed to start somewhere,” I explain. “Chetumal is at the bottom.” It’s logic like that which seems to obvious to me, but to other travelers, and certainly to Paul, is lost. Paul’s the kind of guy where, if he’s made up his mind on something, it’s fact. I learn this quickly, and so don’t push the subject. Chetumal is not a vacation destination in Quintana Roo, I’ll agree. It’s the kind of town you visit if you want to see what Mexico is really like. What real, live, Spanish-only speaking Mexicans do on their day to day. Any given night of the week, including weekends, adults will sit on stools around food carts sipping Coca Cola from tall glass bottles, eating tacos or carnitas or Mexico’s take on hot dogs, wrapped in bacon and covered in fresh, not soupy, salsa. Their kids kick soccer balls up and down skinny sidewalks, between all of the pedestrians on their way to find food carts of their own. I love these people. They are the opposite of the tourists a few hundred kilometers north, sitting on the beach and drinking their vacations away. These are hard-working Mexicans who, when the day is done, seem to want little more than to talk with their friends in the streets of the city they call home. In Mexico, family is the most important. We end up renting an AirBNB for a few weeks. It’s a complex of a building, painted white and slowly crumbling, enshrouded by jungle flora that creeps onto the wrought iron balconies, grows thick over a net that covers a rather pristine pool, and taps against glass windows when the wind picks up. A host of ex-pats from Canada, the US, England and Argentina either live, work or are staying there temporarily. It’s a large building, but everyone runs into one another now and then, as the hallway from one AirBNB rental will lead through a room that plays host to the kitchen for another. A wrong turn will lead you into the owner’s upstairs flat or into Judy, the woman who largely manages the AirBNB side of things, in her bottom floor apartment. Judy makes our kids homemade jello and translates for me to mechanics all over town when my own Spanish skills don’t suffice. The owner of the complex lends me his power tools to rebuild some cabinetry as we wait for the Bus’ starter to get rebuilt. It never does get fixed, we end up buying a new one from the US. That means shipping. Shipping to Mexico, or even around the country, is slow, if it even works. We have plenty of time to explore the city. Along the Caribbean a road by the name of Bulevar Bahia (Bay Boulevard) hugs the water from the Malecon near downtown Chetumal to the smaller town of Calderitas just north. It’s a windy two-laner, with a bicycle lane and palm fronds hanging down into the right and left lanes alternating leaving you feeling like you’re playing a video game’s worth of dodging cyclists, fauna, construction cones and whatever else comes spilling into the street. “They love kids down there,” I tell Paul, who’s been going on about the police or his ex-girlfriend or something all this time. “Oh yeah, all over Mexico, family is the most important,” he replies. He’s right. Parts stores. They’ve got an Autozone and a place called Valdemar, the latter being a Mexican chain, and an experience all its own. When you arrive, take a number and make sure your Spanish is up to par. La Barra and Nuit Bistro. The former offers better food and great cocktails, with a foosball table and MTV in espanol playing all day long. The latter is bar food and a few craft beers, in downtown Chetumal proper. Walmart is likely going to be your go to for a big grocery store, though little tiendas exist throughout the city. It seems at times as though people would rather live with a sister they hate and mother who nags them well into their 50s than go off and set out on their own. Loneliness seems to be a larger motivation than independence here, something I neither admire nor judge. It’s simply the way the culture here tends to work. “They’ve got these trampolines,” I begin to tell Paul, but he’s back to talking about some crazy adventure he had in Tequila a few years back. I’m still reliving Chetumal. At one point along Bulevar Bahia, some local guy got the idea to set up three trampolines in a grass lot. The city built palapas soon after seeing how many people came just for the trampolines, and a dozen food carts figured out quickly that parents get hungry watching their kids jump up and down all day. The place is always packed, and one of the Mexican guys running it speaks English and practically darts across the place to chat with us every time he sees our kids arrive on the scene. 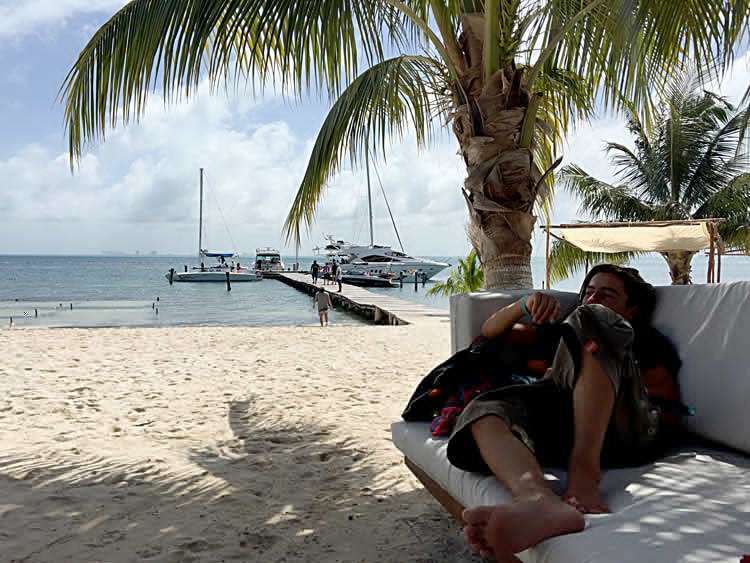 “It’s very different in Chetumal,” he says, “in Mexico. In the US, you clean your water. Here, we don’t so much.” He talks to us about things like this, infrastructure. How the cell phone companies work. Problems he sees with the electric and water companies. How most of the Mexicans he knows who visit the United States to work are just there to send money back to family. We talk about how non-touristy Chetumal is. How these are the real people, this is the real Mexico. 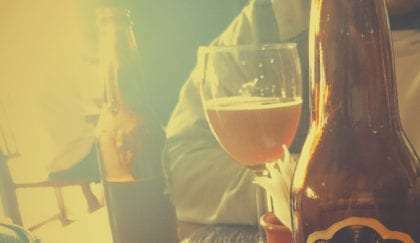 On the hunt for craft beer in Quintana Roo? From Chetumal to Cancun, Quintana Roo is one of the hot spots for craft beer in Mexico. We’ve put together an article about where to find it, from the Yucatan to Baja. A good IPA can be elusive south of the US border, but they certainly do exist. 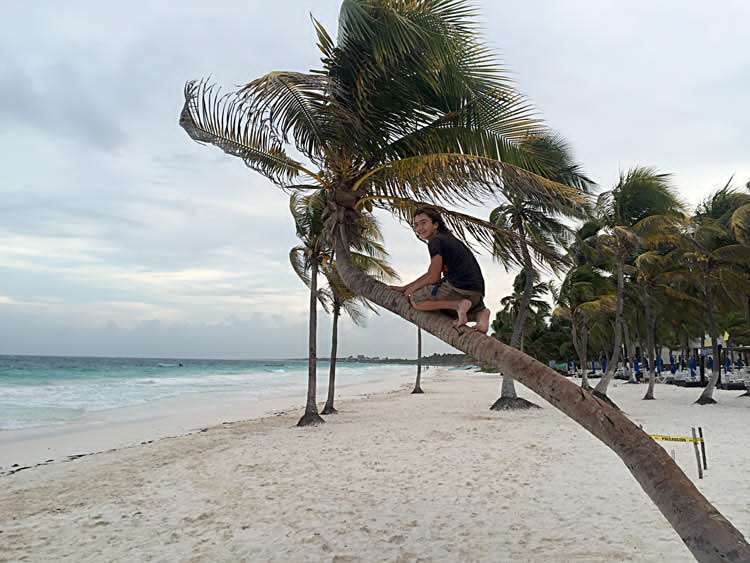 “Have you been to Bacalar, then?” I ask Paul, who’s changed the topic of conversation from why you should never let the police know if you speak Spanish–and he doesn’t at all–to everywhere he’s been in Mexico. “Cenote Azul?” I inquire. We’d gone. He’s right, it is strange for a cenote–a term typically reserved for underground pools of water where the limestone earth above has worn away, providing passage to anyone looking to escape the heat of this part of Mexico for frigid, crystal clear water. “Yeah, Blue Hole,” he repeats the rough English translation of Cenote Azul. Take a dip in Cenote Azul, and be sure to bring goggles…the water just below where you enter from the restaurant is scary deep! “I guess it’s all about the limestone, the way the water came to be where it is,” I try and chat with Paul about the scientific reasons behind why a cenote could be above ground, but he’s quick to move the conversation along. “Small town, it’s a magic town,” he says it so nonchalantly that if one didn’t know about the “magic towns”, a.k.a. Pueblos Mágicos, you might just think he was being literal. El Barril Grill for a craft beer lover’s paradise. Hostal & Suites Pata de Perro for just about anything else. Where to camp? Green Monkey Hostel allows you to camp in their yard or you can camp at the Balneario. Both spots have options for electricity, and are pretty affordable. Boondocking in the street near the square is also allowed, but you may want to check with the police just to get their permission first. Cenote Azul is a restaurant along the lake where you can eat, drink and cool off over a crazy deep hole in the lake. A Pueblo Mágico is a–typically small–town in Mexico that’s recognized for its history, beauty or maybe just because it’s a popular tourist destination. They usually have better services like running water and paved streets, and tend to attract better restaurants, hotels, etc. They’re the cream of the crop when it comes to small town Mexico. 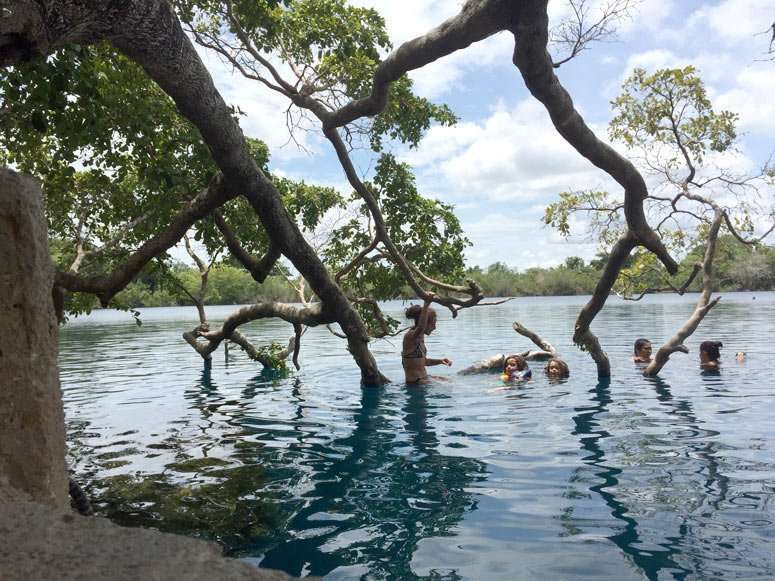 Indeed, Bacalar is teeming with young travelers from around the world. The town must have five or six hostels, some of which allow you to camp just outside of the building on a street or in a grass lot. This creates a foot in the door for restaurants to offer a variety of food you don’t tend to see outside of Quintana Roo. A host of young men from New Zealand sip coffee and then mimosas the day we arrive, the backs of their chairs nearly into the street, speaking broken Spanish with their waitress and laughing like still young men on a trip around the world tend to do. Around the corner and off the main circle, a small restaurant serves Yucatan-style pork, a boneless steak’s worth of the sort of color and flavor it might take some people a minute or two to appreciate. The walls are lined with emptied bottles of craft beer from around Mexico and the United States, and a chalkboard near the brick archway that leads into the kitchen speaks to their current selection. We choose the one table with a broken fan and swat flies away as the setting sun begins to creep in through the open sides of the patio. 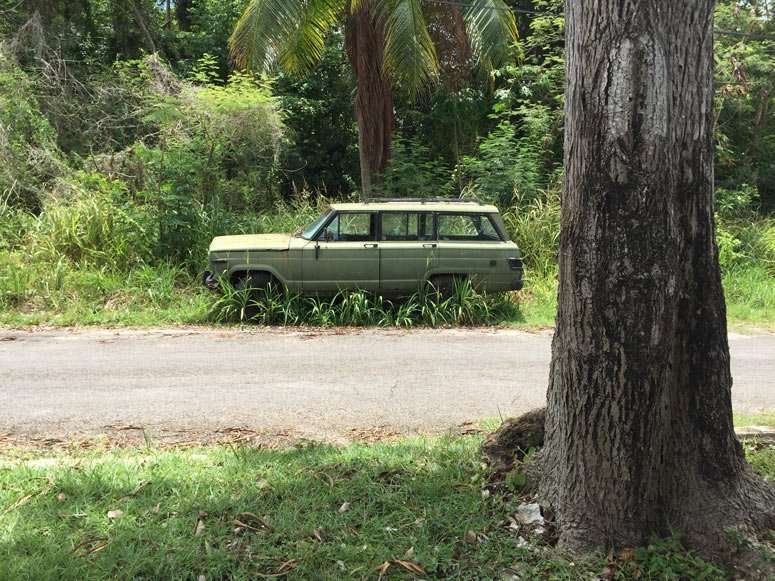 From the town’s square, head to the water and drive south for some beautiful lakeside scenery, gorgeous flora, and a few old gems like this retired cruiser. Near the lake itself, and still in town, a tower of a waterslide hovers above a mini-resort, a few palapas, a restaurant clinging to a pier and a parking lot we’ll call home for the night. The waterslide has seen better days though, and is now roped off and boarded up, a crack in the tubing about halfway down promising a major infraction to any spine crazy enough to try it these days. Young men and women jump from the pier, swim in the setting sun rippling slightly on a mostly still lake, sipping the last of their drinks before a security guard sends them on their way. The gates close, and a tent’s worth of lovers become our only neighbors for the night. “Mahahual? I got to the lighthouse, saw the big cruise ship, and turned right around.” Now I’m speaking with a fellow who goes by the name Phillipe, a Belgian who’s been traveling the Americas out of his truck camper for ten years now. “You didn’t check out the Malecon?” I ask. He shakes his head slowly, matter-of-factly. Camp for free next to the lighthouse, no questions asked. You can also pay $100 pesos per night to camp in the parking lot behind Blue Key Resort, though keep an eye out for the fire ants! If you’ve got a tent, you’re probably better of staying in the tenters section across the driveway. Rent bikes from Blue Key, too, relatively cheaply, but make sure you get a good one before you pedal off. You can also borrow free kayaks for as long as you’d like, if you eat at the Krazy Lobster. Mahahual is the next logical town to visit when headed north from Bacalar, though an hour out of the way if you’re just trying to make a mad dash to Cancun. Luckily, we weren’t. “Yeah, the cruise ship kind of dwarfed the place,” I reply, getting back to common ground. But it’s a lie, at best. When we arrive in Mahahual, it’s quiet and lively simultaneously. Kids on bikes race up the Malecon between men hacking at coconuts with machetes, mixing tropical drinks in the shade of a slow blowing palm tree. It’s low season, but there are still tourists. An American family with young kids and a few Australian girls dot the resort, but mostly it’s twenty-something Mexicans ready to party this one last week of summer away. Mahahual is a flowing gown of pedestrian-only sidewalk laced with beachside lounge chairs where smiling men speak perfect English. It’s walking vendors wearing ten hats on their head, carrying fifteen straw bags in one hand and a necklace display in the other. Mayan women show us their wares, tell us their story, where their village is, and then push the hard sell. We walk by a place called the Krazy Lobster a few times over the course of our first evening, always declining generous offers to dine at their establishment by two or three guys who’s only job seemed to be to lure in customers. The next morning, their subliminal pitch works, and we’re toes in the sand sitting at white plastic tables as the morning sun starts to do it’s thing. “You can order some drinks now, or some food, or go and take the kayaks out for awhile,” our waiter is friendly, accommodating, overly so perhaps. He speaks to us like we’ve all had Thanksgiving together for the last six years. “Kayaks?” I ask, assuming there’s a catch. Mahahual is full of gems like this, authentic Mexican hand painted signs on stores. 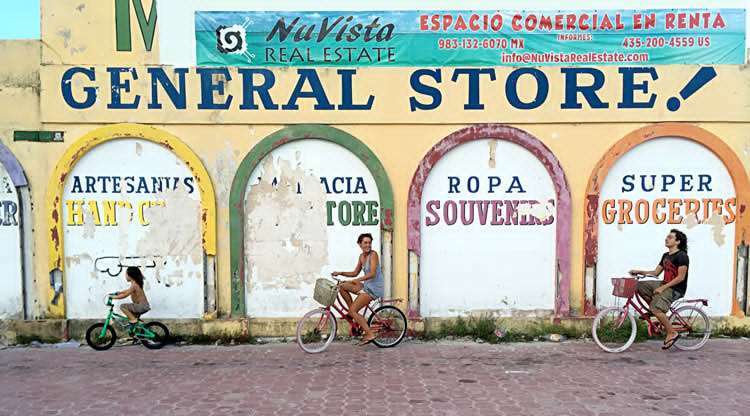 Rent bikes and tour the Malecon, a brisk, level ride through one of the lesser known beach towns in Quintana Roo. As you can see, English is spoken. “Yeah, you’re here now, you’re here for the day. Just tell them I told you that kayaks were no charge,” he doesn’t wait for a response before repeating our drink order and hustling off to whatever’s next. We drink a little, eat a little, and indeed, the kayaks were free. “I can see though,” I tell Phillipe, “some downsides to it, too.” I’m thinking of the bikes we rent on our first night in town, one has a broken seat, another keeps popping the chain, and the third’s fender rubs against the back tire in an awful noise of a way to make your way around town. The parking lot of the only official campground in town is crawling with ants, the biting type that have found their way into our VW Bus and I thank my lucky stars that my bed is up in the pop top. I did know it, “We’re not always out for the cheapest, we’re out for the best time.” Having a bar right next to your parking lot space and a few shaded lounge chairs on the beach makes a $300 peso per night RV park pretty appealing at times. 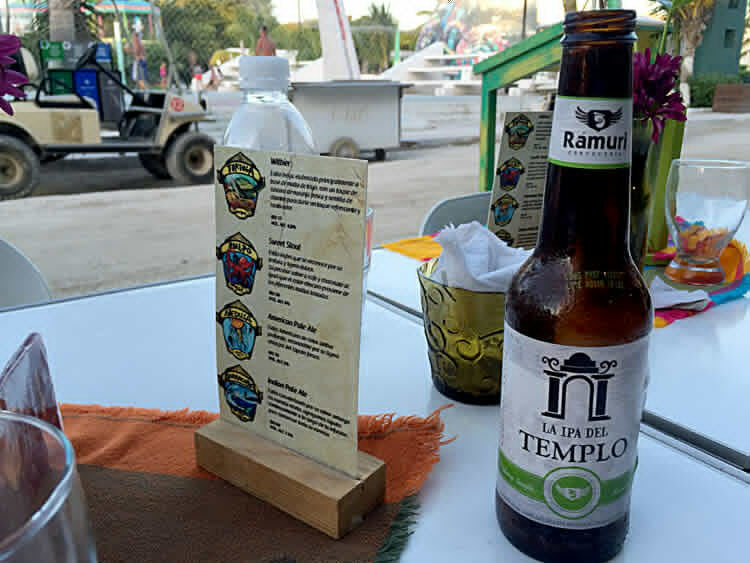 “Tulum, though,” Paul says, back at his RV park’s own bar and palapa, “that’s a place they need to put in a nice RV park.” Paul runs a much nicer than average RV park, not only for Mexico, but anywhere we’ve ever been in North America. “Something right down on the beach, doesn’t have to be fancy, just nice,” he continues. 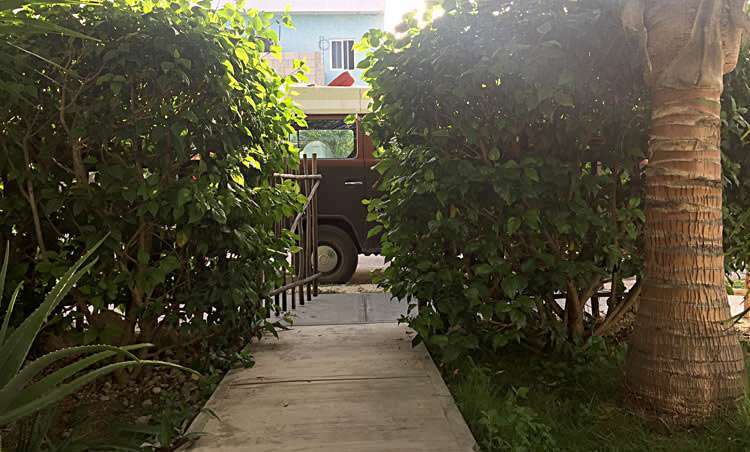 Tulum is full of vans and RVs, even in the heat of summer in Quintana Roo. VW Buses and Vanagons painted up with out-of-this-mindframe designs, old Toyota Dolphins, Class Cs held together literally with duct tape and bungee cords. They’re parked on the side of the road that lines the resort part of the beach, any small patch of sand where the plants have worn away large enough to fit four tires and a home-on-wheels. They’re parked in the back streets of the main town, away from the lights and bustling bars full of young Mexican men and the late night street vendors teaming with families uninterested in calling it a night. And at Chedraui, the big grocery store in town, they put out chairs and stay the night, leave their doors wide open all day long beneath the shade of the parking lot’s shaded spots. In our opinion, the Tulum Ruins are just as good viewed from the beach as paying the entrance fee and walking around in the heat. Start from Santa Fe and walk the beach to get the full coastal effect. Camping? The options are a bit limited. If you want to stay in your van or a small RV, check out Santa Fe on the northern stretch of the beach road. You can also stay in the parking lot of Pancho Villas, or boondock for free at Chedraui. Great food and craft beers can be had at Puro Corazon and El Pez on the southern stretch of the beach road. 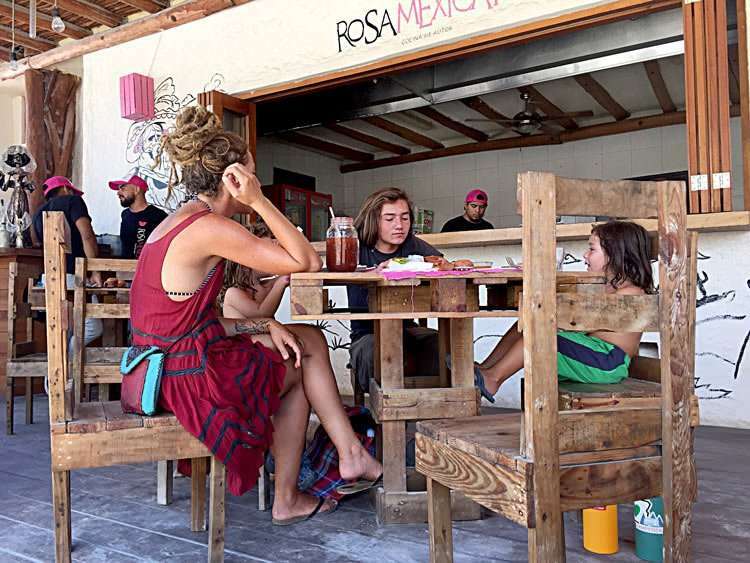 In Tulum town, check El Asadero and Unico. Cheap, awesome cenotes can be found by heading west on MX 109 (i.e., instead of taking the road that leads past Chedraui to the beach, go the other way at the light). There’s one directly after the police checkpoint, on the right, which is a great little hole you can jump into, or another a bit further down the road. “A lot of backpackers there, too, eh?” Paul delivers the quintessential Canadian statement-as-a-question. They pack their bags into smoke shops and cafes boasting the best coffee Mexico has to offer. They ride bicycles from town to the beach, camp in tents at a few officially designated spots on the more “national park” side of the National Park, which seems to legally encompass all of the beach, the resorts, the ruins and the town itself. At the far end of that section, where the mangroves and jungle are allowed to grow more freely, where buildings are significantly more sparse and the road is lined with more cyclists than boutique shops, a tiny beachside resort by the name of Santa Fe allows travelers to park, legally, for $100 pesos per person, per night, between two run down old cabańas who’s only guests these days are tools and cleaning supplies. Every night, and the day’s are hot all summer long, the breeze picks up and cools Santa Fe in its entirety to what feels like near air-conditioning in comparison. 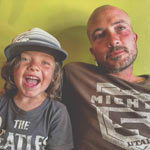 The backpackers begin to return from their days of biking, diving, yoga and maritime pursuits, showering quickly before retiring early to tents staked into a ever-piling heap of sand separating us from the ocean. A mile or so down the road, a campground primarily for tenters by the name of Pancho Villas nests strewn hammocks and planted tents all between the jungles twisting vines and branches. A small bar greets visitors at the parking lot, where young hippies burn marijuana and point newcomers through the campground itself to the beachside restaurant. Beautiful people sway to and fro their drinks on swings that serve as barstools, while still more play volleyball or climb coconut trees to a radio chanting out Bob Marley tunes. Camping at Santa Fe, for about $100 pesos per person, is a no frills, no hookup spot between two old cabańas, but comes with cold showers, bathroom access and a only a few steps from the beach. We’d been told that a few times, too, just north of a place called El Paraiso there’s beach access, the same short, sandy road that Pancho Villas lives on, where you could drive up and camp all night for free. Skip the fee to park at El Paraiso, just take the next right, same road as you take to Pancho Villas, park for free, walk to the beach and hang a right. You can still use the beach gear if you buy some drinks, and get the full experience without the additional per person fee. When lounging on the beach grows a little tedious, we drive to a few local cenotes, none of them more than 5 minutes outside of Tulum itself. One leads you down long wooden stairs to two caverns of which you can swim back and forth between. The next is just a hole in the ground that you can jump down into, splashing quickly out of the burning rays of the summer sunshine into frigid bliss in the shade. The final one is more or less open, no cave, but has a high wooden staircase that gives you a good fifteen or twenty foot diving platform down into a similar experience. They cost around $120 pesos per person to get into, all day, bring your own food, beer, whatever. This is the cenote just after the police checkpoint as you head west out of town. Jump in already! Ten miles up the road, headed toward Cancun, they turn into “Cenote Parks” and carry the same numeric value, but in US dollars. We settle finally on a place called Dos Ojos, somewhere between the two experiences, and alive with motmots, bats and other jungle creatures, all for around $200 pesos a pop. Seems like a good middle ground. Working from Santa Fe or any of the free spots in town proves difficult, we’ve just lost our cell phone plan from the US for being in Mexico too long, and so we turn to AirBNB. Townhouses and apartments just outside of town run $30 – $45 US per night, including air conditioning, WiFi and a pool. We eventually find the perfect place, right in town, at the higher end of that spectrum, and call it home for two weeks. A cute German woman runs the place and is never without her Mexican handyman sidekick, who can’t be older than 18. We can walk to town at night while our teenager watches his younger brothers. Restaurants offer up everything from spins on traditional Mexican to Italian, Brazilian, sushi and good old fashioned hamburgers. It seems that we can’t pick a bad restaurant, and after going out to eat–just the lady and I–we start to just stop in at whatever place is next in line as we walk down the street. El Asadero for great Mexican and Unico for tapas stand out in Tulum town, Puro Corazon and their pulled pork tacos down in the resort part of the beach road. One night we don’t feel like putting one foot in front of the other, and I manage to connect with Papaya Pizza Company via Whatsapp as we translate our way into the nicest man you’ll ever meet, the chef himself, delivering us two spectacular pizzas on foot and in person. AirBNBs can be had for under $35 if you don’t mind being a little out of town (not too far, though!) This one was around $45 and was within walking distance of everything in Tulum town proper. His wife makes our kids pancakes even when we don’t order them, at least once a week. “Customer appreciation?” we laugh, wondering if it’ll be a part of the bill when we go to leave. She brings her nail polish out and using some cut up white t-shirts and old beer cans, makes little ghost decorations for Halloween, though it’s still August. Check out Zama, a cool beach resort that’s free to get in, has craft beers and excellent bar food, as well as a few pristine pools that are perfect for kids to jump in or adults to lounge in beds poolside. There’s free snorkeling on the bridge northeast of the island, which leads to a hotel named Mya. Rent a golf cart and cruise around…or just hang out at the town square for tons of kids activities and plenty of food carts. Cancun is a nice basecamp for visiting the islands, cenotes and ruins in the northern slice of Yucatan, and Isla Mujeres is our first destination. You can shuffle your car–or van–out there via ferry, and likely not be hassled if you practice even a modicum of stealth camping on the streets or in the rare abandoned parking lot on the east side of the town proper, but we opt for a hotel room at the El Paraiso Mexicano, which we score on AirBNB for $45 / night. Nothing fancy, but fire dancers show up one night and a raging party full of young travelers drawn from the woodwork like cicadas too long dormant, and we can walk anywhere for evening date nights or morning iced coffees alike. 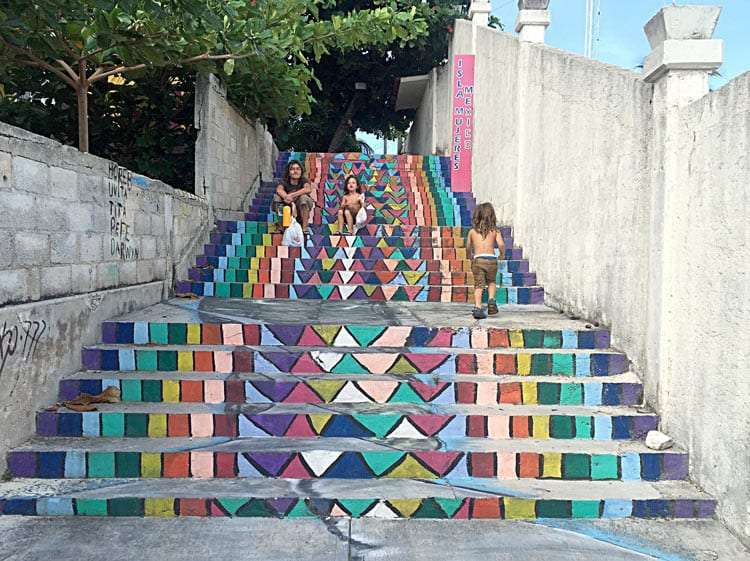 The stairs to Hotel Paraiso Mexicana, where via AirBNB you can get a nice room for around $45 US. We spend a lot of time at a cafe where our iced coffee cups read “Mogagua” and we can slow into long summer days of driving golf carts from one end of the island to the other. There’s a beachside resort a few miles out of town proper, Zama is the name, and we fall asleep on an outdoor bed draped in sheer curtains after an IPA or two, the boys swimming in the pool, jumping from a high wall on one side and swimming to the bottom between appetizers and wherever we’ll end up next. Our oldest son reads a book as the boats come in and out, working hard in the background of his personal paradise. As evening dims the horizon, a man with a slew of tricycles and electric cars sized just right for children rents 30 minutes of driving around the town’s square worth of fun for 30 pesos. The street vendors come out, and so do the guys working the pedestrian-only sidewalk that winds through the heart of town, enticing you to visit their souvenir shops or restaurants, all of which have either the best, coldest–or both–beer in town. Fancier shops than Mexico seems accustomed too sell beachwear for $200 US a swimsuit. A steak and burgers place touts all grassfed beef and sushi is plucked from the sea and delivered to restaurant backdoors not only the same day, but within hours. We fall in love with Isla Mujeres, and when nearly every other vacationer in town scrambles to snag a ferry back to the mainland as Tropical Storm Earl threatens the little island with pounding rain and crunching thunder one night, we decide to prolong our stay a few more days. Now relatively lonely on the island, we snorkel for free at the bridge leading from Isla Mujeres proper to Mya, one of the few multi-story hotels that takes up an entire other, much smaller island to the north. “How’d you like Woman Island?” Paul asks as we get off of the ferry and he throws our bags in the back to shuttle our return to his RV park, our Volkswagen. So we go. Unlike Mujeres, Holbox doesn’t have a ferry for vehicles. The drive from Cancun to the ferry terminal, a couple of hours and a half or so, is all dead straight roads through tiny Mexican towns where English hasn’t taken hold and transportation for the locals largely means motorcycles and motorcycle-powered rickshaws. I wonder how many of the millions of people who vacation in Cancun ever make it out this way. Pura Vida Sushi has more craft beers than probably anywhere else in Mexico, some 70+ and the owner said she’s shooting for 120 by the end of 2016. You can tent on the beach if you want to save the big bucks it costs to stay here. Rent a golf cart and try out the resorts, typically free if you buy a few drinks, south of town. You can find crocodiles and bird-watching aplenty down there, too. Holbox itself though, is a contender for “Best of Mexico”, easily. Smaller than Isla Mujeres, all dirt roads that fill quickly with puddles and even rivers if the rain comes long, hard enough, every inch of town proper is adorned with the finest restaurants, food carts and bars this country has presented thus far. 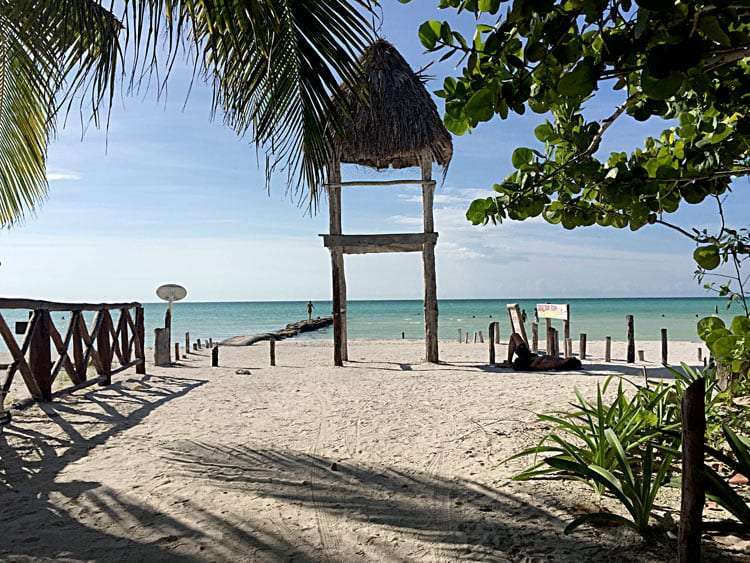 Though you need to take a ferry to Holbox, nothing is preventing you from camping on the beach once you get there. Bring a tent, save a few hundred bucks. We find a dingy little AirBNB for $50 / night and wish we could stay longer than the week we do. Pura Vida Sushi and Roots Bar boasts some 70 craft beers, all from Mexico. I stop by no less than twice a day. In the center of town, the square is filled nightly with a giant funslide, a two story trampoline house, and yet more kid-sized electric cars for rent. Renée experiences the best hot dog of her life, the only one she’s ever finished since high school, typically finding that particular foodstuff just shy of anywhere close to her radar…and then orders a second. All around a vintage VW Bus that serves as the kitchen, the restaurant Et Voilà is nearly too full for us to find a table as the owner approaches us, quickly greeting us in Spanish and French, only halfway through our breakfast realizing we’re Americans and switching to English. Across the main square, RosaMexicano draws us in every other morning for whatever they’re cooking that day, and always a side of refried beans wrapped in a seared cheese that acts as a sort of tortilla for our new favorite side dish. The golf carts on this island get snatched up quickly though. When we do get one, it has no breaks. After a loop around the island, I return to tell the guy who rented it to us about the malady, to which he replies, in Spanish, “Nada carritos tiene,” which may have meant, “None of our golf carts have brakes,” but I was pretty sure he was trying to convince me that such a feature simply hasn’t been applied to the world of golf carts in general on Isla Holbox. Storms from Earl come once again and, though we’d love to stick through them and stay on Holbox for an easy month, the price and value of our little hole in the wall room there don’t add up. We join the rest of the riotous crowd desperate to board the 11:30 ferry back to the mainland and are nearly trampled to death attempting to reboard the boat, before quickly realizing that we can either get out of the way–and lose the only boat back for the next hour–or join in the fray and push our way forward as well. An old woman pushes our 5 year old son to the ground, securing her seat on the ferry, and the crowd becomes a solid wall, like a ten pound sac of flour trying to pour its way into a jar made for a cup of sugar. We pull our own to his feet and find ourselves in the last row of seats headed back to the Yucatan. Deliciously interesting choices for breakfast at Roma Mexico, complete with Mexican hipster servers. Some 70+ craft beers at Pura Vida on Isla Holbox, just near the town square. As soon as everyone has realized their place on the ship, a man walks down from the top deck, picks up a microphone, turns on an amplifier, and begins singing island music. The ferry goes wild, young girls dancing, old men singing, and what was moments ago a life or death march to gain access to this boat turns into a raging party on the water. Two flamingos pick at whatever fish they’re finding just outside of the mangroves as we watch the rain cloud away Holbox entirely. That ends our travels north into Quintana Roo, the road ending in the Gulf of Mexico. Arriving back at Paul’s RV park just east of Cancun, he’s there toiling away at what deeds a campground owner must deal with on a daily basis. “So, you liked Holbox, right?” Paul and his wife Christina shake our hands as we pull out. “We’ll be back someday,” I raise my voice to the tune of our engine. “Yep. Doesn’t get better than paradise…” and the rest of his words fade into our rear view mirror. We slowly make our way back south, Belize-bound, before arriving in Chetumal once again. At the trampoline playground, Steven is there, and though it’s been months, he once again runs across the park to say hi. “You should go to Calderitas, I’m telling you man,” he repeats again. So, we do. Though pricey, Xel Ha is that Caribbean-front paradise we expected all of Quintana Roo to provide. After a summer spent in the state, Xel-Ha Trailer, RV Park and Restaurant turns out to be the one and only best spot to camp in all of Quintana Roo. Every evening the wind picks up, the heat dies down, and we watch shooting stars over the Caribbean as our final days in the Yucatan pass into memory. Bonus! Where to Boondock in Quintana Roo! Nearly every inch of Quintana Roo’s coastline is either highly developed, private property that requires a fee to access, or is occupied by protected jungle or mangroves. So what’s a boondocker to do? boondocking: to camp somewhere, usually legally, for free. There used to be a spot in Tulum, just before El Pez as you head south on the beach road…but the last time we drove by, a fence had been put up to keep people out. Walmarts and Chedrauis and Megas offer parking lot camping. 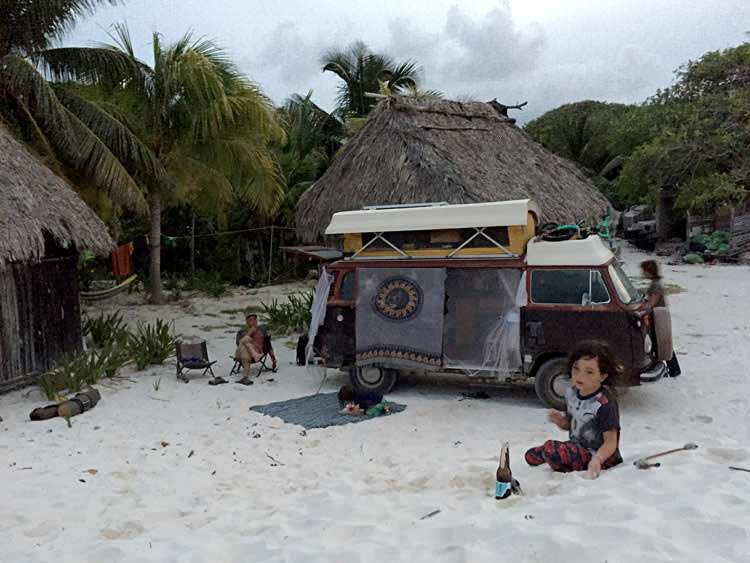 But, if you’re looking for the real Mexican beach boondocking experience, head south from Mahahual to Punta Herradura and beyond. This is as close to the Baja beach camping experience as you’ll find in Quintana Roo! Information on getting into Baja, crossing to the mainland via La Paz ferries, and the best places to visit while in Baja California.